Home Sports Rob Gronkowski Age, Height, Weight, Body Measurements, Why Was He Suspended? Rob Gronkowski or Gronk as he is fondly called is an American football player playing the position of tight end in the National Football League (NFL). His career has seen him sign a contract worth the highest amount of money ever offered to a tight end in the NFL, similarly, the grid game player is also known to have scored a good number of touchdowns in three consecutive seasons despite being down with injuries for most of the time. All these and more make the biography of Rob Gronkowski an interesting piece to read. Find out more about him here including why he was suspended from the NFL at a time. Gronk was born on the 14th of May, 1989 in Amherst, New York into a family of football players. His parents are Gordon Gronkowski and Diane Walter. He is Caucasian with Polish blood flowing in his veins. Rob is the second of five brothers who were all college football players. Moreso, he schooled at the Williams Ville North High School, where he began his career in his junior year as a multisport star playing tight end in football and center in basketball. The Amherst born player’s outstanding performance in football landed him an All-Western New York first team and All-State Second Team player titles. He won SuperpPrep American and Prep-Star All American titles amongst many other titles he won in his senior year in Woodland Hills High School. On graduating from High School, Gronk continued his footballing exploits in the University of Arizona where he played for the Arizona Wildcats beginning from 2007 through 2009. He missed his first 3 games in the opening season of 2008 but came roaring back to make up for the loss recording 47 receptions from 672 yards. A performance which earned him the title of All-Pac-10 First Team tight end. He was also named Associated Press Third-Team All-American the same year. In 2010, Gronkowski was signed by the New England Patriots after graduating from the University of Arizona. He was briefly sidelined due to a back injury but came back to quickly assert himself as a rising star by breaking the record as the First and Youngest Rookie in NFL history to catch 3 touchdowns in a single game. He was handed a Rob Gronkowski Award (which was created in honor of him) by the Madden NFL12. Due to his impressive performance, the New England Patriots extended his contract in a 6-year deal worth $54 million in 2012; this became the highest offer ever made for a tight end in the history of NFL. He proved his worth by scoring 10 touchdowns despite suffering a broken forearm, this then placed him as the third tight end to achieve such a feat in 3 seasons behind Toney Gonzalez and Antonio Gates. 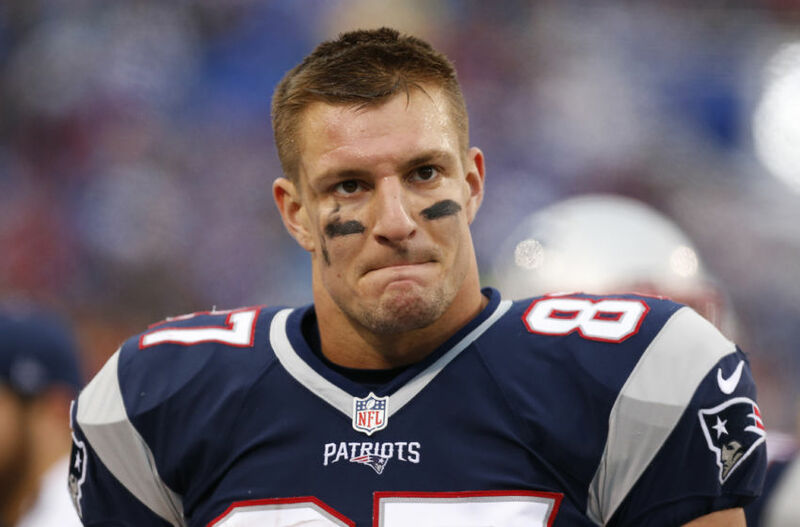 Gronk was beset with forearm injuries in 2012 and early 2013 for which he required surgeries on both occasions. He underwent another surgery after a back injury in June 2013. On December 8, 2013, playing against Cleveland Brown, he suffered a right knee injury following a direct hit from Browns safety T. J Ward. The injury from the collision saw him end his 2013 season prematurely. He made a tremendous comeback in 2014 helping the Patriots secure a 28-24 Super Bowl XLIX win over the Seattle Seahawks. The footballer was awarded the Comeback Player of the year award that year despite being fined twice for unnecessary roughness and once for striking an opponent. Gronk’s salary and Cap Hit bonuses are estimated to be $9 million annually and he has an estimated net worth of $15 million. He is also presently the highest paid tight end in the NFL. The parents of Rob Gronkowski are Gordon Gronkowski and Diane Walter. He is Caucasian with Polish blood flowing in his veins. 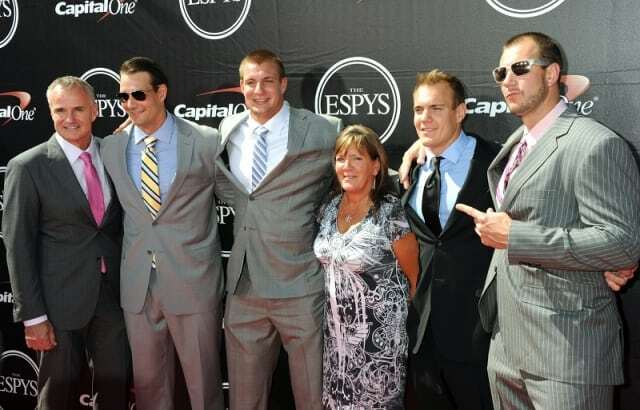 Gronks is the second son of five brothers, who are named Chris, Dan, Glenn, and Gordie Jr. (in no particular order), Rob is the eldest of all and all four of his brothers have played football in the NFL. Rob Gronkowski was handed a one-match suspension in the 13th week of the 2017 season for body slamming Buffalo Bills quarterback TreDavious White when the quarterback intercepted a pass meant for him. The foul play gave White a concussion and earned Gronkowski a one-match ban the following day on December 4, 2017. He served the suspension fully and has since then returned to the league. Though there were rumors of his retirement in 2018, Gronks has debunked all. Typical of most American football players, Gronk is massively built standing at 6 feet 5 inches tall and weighing 120kg.